International Women’s Day is celebrated every March 8th and celebrates women’s achievements throughout history and across nations. Data from the American Community Survey and U.S. Census indicates that southern and midwest states have the lowest rates of female business owners, while states on the West Coast tend to have the most. This can be due to the fact that women have a harder time getting funding whether from private investors or banks than men do. Many industries are male-dominated and women are not taken seriously because they are defying social expectations. Forty-five percent of female founders reported that a lack of available advisers and mentors limits their professional growth. 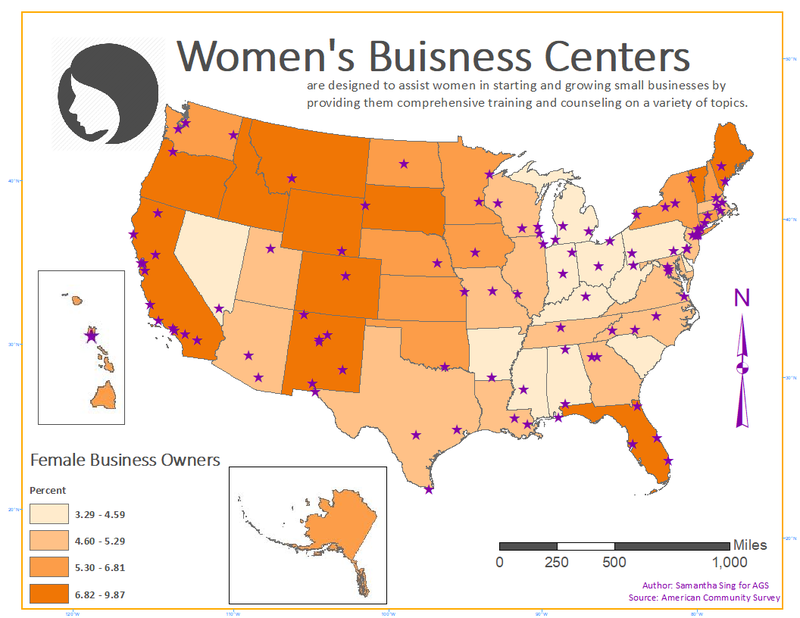 This week’s map shows the percentage of female business owners along with the location of Women’s Business Centers. WBCs represent a national network of over 100 educational centers throughout the United States, which are designed to assist women in starting and growing small businesses. They seek to “level the playing field” for women entrepreneurs, who still face unique obstacles in the business world, especially for women who are economically or socially disadvantaged, by providing financing resources, comprehensive training, and counseling on a variety of topics in several languages. So why is it important to encourage women to be entrepreneurs? Having your own enterprise is a form of power and it creates independent sources of income and influence. Men are more likely to be hired than women for a job even though they have the same qualifications. It leads to the creation of more safe work environments, where women feel welcomed and do not need to worry about harassment or assault. As women entrepreneurs prioritize the hiring of women, more leadership opportunities are being created for a future generation of more entrepreneurs, political leaders, scientists, and more. This map was made using ESRI software.